Hewn over 120 years ago from forest, rock and swampland, downtown Vancouver and its shoreline have been dredged, back-filled, paved over and built up to become the glass metropolis it is today. Seen from a distance, the skyscrapers and towers of the downtown peninsula glisten on postcards, their constructed beauty still contained within the majesty of B.C.s wilderness. What tourists photo leaves out the North Shore mountains, Stanley Park and the three bodies of water that border downtowns city of glass? Seen up close, the downtown stretches north to south from False Creek to the Burrard Inlet, begins in the west at Burrard Street, includes Coal Harbour (a sliver of high-rises north of Georgia), and to the west even counts Science World. A renovated B.C. Place changed the skyline and three professional sport franchises (hockey, football and soccer) remain an entertainment draw along with the neighbourhoods concentration of clubs, theatres, restaurants and galleries. The Vancouver Business Improvement Area claims more than 8,000 businesses, half of which employ less than five people (one third employ five to 20 people), as well as the central offices that drive B.C.s resource and energy sectors. Each work day, 57,000 trips are made through Waterfront Station. Over the decades, the commercial centre has moved from a townsite called Granville closer to actual Granville Street and with each generation, neighbourhoods distinguished themselves economically and culturally. Gastown, Yaletown, Chinatown and the Downtown Eastside are not strictly part of the downtown. They are their own places. 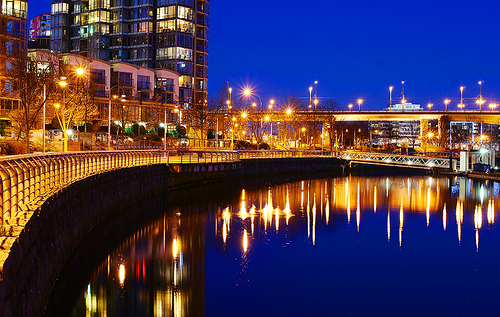 Named the worlds most livable city for five years until 2011, Vancouver slipped to third behind Melbourne and Vienna. Affordability (or a lack thereof) can make the lifestyle and attractiveness inhospitable, which the Royal Bank of Canada described in 2012 as extremely poor and the least affordable in the country. In 30 years, the neighbourhood became the most populated and the most dense in the city. Only two per cent, roughly 6,600 people, called the downtown home in 1971. In 2011, about 54,000 people lived downtown.